Are you prepared for the ever-changing trends in the travel industry? The truth is, this can be a big challenge for travel companies and marketers. In this post, I explore how 5 travel companies are leveraging content marketing techniques to increase their SEO visibility and drive new customers. Make no mistake about it, there is a huge amount of money in the travel market. 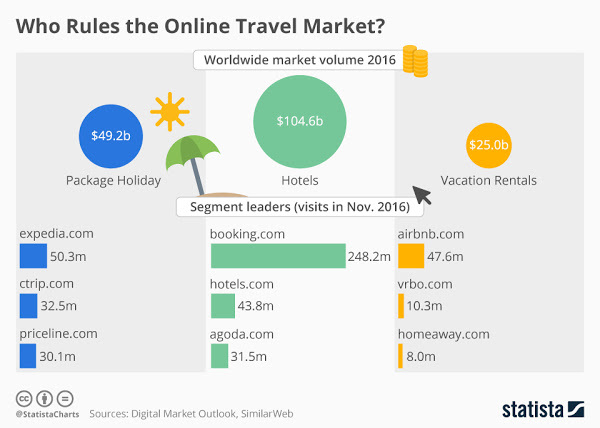 According to Statista, $104.6 billion and 49.2 billion were spent on Hotels and Package Holiday bookings in 2016 (worldwide) alone. But there’s so much to attend to. You need to manage content, review platforms, understand how to use social media to your advantage, simplify your booking engines… just to name a few things. You have to be in control of your leads to get your conversions up to scratch, and that’s what effective content marketing offers. You can start to fire up your travel marketing game by replicating SEO tactics that are proven to work—TripAdvisor and Hotels.com, among others, are already reaping great rewards as I’ve outlined below. Bonvoy Adventure Travel boosted their on-site traffic, quadrupled their on-site transactions, and increased their conversion rate by 21%. But they had to overcome some challenges to get there. Bonvoy Adventure Travel’s problem was that their brand wasn’t visible enough to their target audience—which resulted in a limited user base, and because they had a smaller budget compared to big name travel companies, it was difficult to drive sales through their website. Initially, email was their only channel for marketing to existing customers. That was short-sighted. Bonvoy Adventure Travel needed something more sophisticated than that. Bonvoy Adventure Travel shifted from creating small-scale, sale-centric content to producing large amounts of high-value content on topics related to traveling and adventure. This content marketing approach generated a lot of organic leads for Bonvoy Adventure. Why? Because people were looking for items of value, not for sales information. 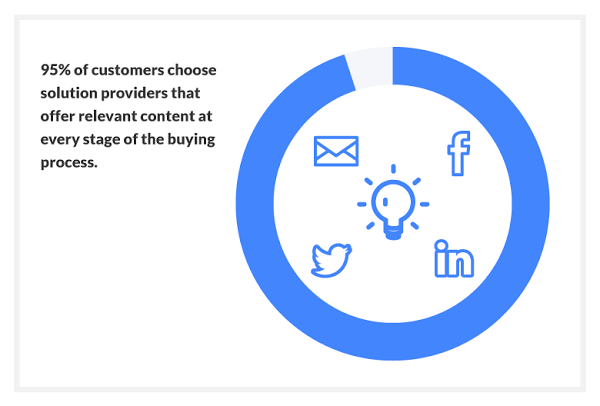 Studies by DemandGen show that 95% of customers choose a brand that offers relevant content at every stage of the buying process. But it doesn’t end at creating relevant high-value content. You need to make sure that it’s clear what audience you’re targeting for. To this end, Bonvoy Adventure Travel did a lot of guest columns, building relevant industry links which contributed substantially to their success. It didn’t generate only search traffic for them, but referral traffic as well. Results: After developing an effective SEO strategy and then taking the right actions, the company saw over 148% increase in their website traffic, a 21% increase in conversion rate, and an overwhelming 200% increase in onsite transactions. Kimkim’s case study is another insightful case study you want to read. Over 300% increase in organic search traffic in 4 months. Kimkim understood the concept of developing a winning strategy first, before anything else. As a result of that, the company’s website now generates search traffic consistently. They partnered with local guides that create useful insights and information with the objective of giving their users the best experience. Unfortunately, the team at kimkim had a problem: they wanted to rank higher for some important travel search phrases and to improve their organic search traffic. It was an uphill task, thanks to their high competition. They started by conducting a complete audit on the website—by manually inspecting every page and analysing data from Google Analytics and Google Search Console. One of the most important things the kimkim team did that helped to shape the way they conducted their marketing was understand their audience. Through their partnering with these local guides, they were directly targeting travellers already invested in seeking out information about sites – which helped to build their long-tail keywords, and allowed them to create a more specific SEO roadmap and strategy. What else did they do? Not only did kimkim build their rankings through targeted keywords, they also used digital PR to build their link portfolio, and they created high-quality relevant content on their blog to attract the target audience who often search in Google. That’s how they increased organic traffic by 300% – and grew their revenue. To increase the number of visitors to their website. To identify the lead sources the yielded the best conversion rate and ROI. Unfortunately, over the years they have been investing in advertising, but not effectively. They were wasting their ad spend because the target audience wasn’t clear. They didn’t have enough information about who their target audience is, how the visitors landed on their website, or what their needs were. 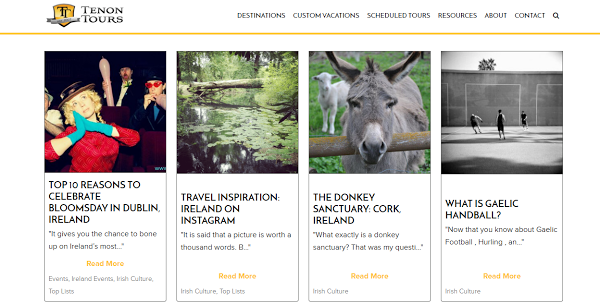 Tenon Tours invested a lot of time in creating compelling content the target audience would love to read, such as blog posts about Irish culture, local events, and interesting travel advice. They used tools like KeywordTool.io to organise the keywords her audience would likely be using to search for Tenon Tours or travel-related keywords. 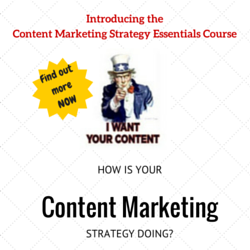 They then optimised the content with those keywords to improve the content visibility. With these tactics in place, the search traffic to Tenon Tours grew by 54%. Another very important thing they did was to repurpose the successful content she already had into other formats. As a result, a new audience was reached and new leads were generated. The company’s approach to persuading the visitor to take an action was different. Every time they create a new post, they will post an excerpt of the content and require users to subscribe to download or subscribe to get the full-blown PDF version. According to the team, this powerful (yet risky, because it can discourage readers) practice accounted for some of Tenon Tours’ highest conversion rates at an average of 33.5%. Inbound marketing truly redefined how the company acquired leads. In addition to that, Tenon Tour also recorded a huge conversion rate through their email. By building a relationship with subscribers, and helping them with great deals, they increased sales by 129%. Shorefield has a great product offering, a range of self-catering, camping and touring holidays and holiday homes, each based in an enviable location on the stunning South Coast. But Shorefield didn’t start out with an effective SEO strategy. Although they were generating some decent traffic to their website, most of the visitors were irrelevant and not helping the business in any way. So at this point, the aim of the campaign was far more than just increasing rankings — to increase revenue. More attention was given largely to improving the performance and accuracy of keyword targeting. Using long-tail relevant keywords to drive targeted customers to their website was a huge success. The project saw great results. Shorefield organic search revenue increased by 75%, while organic search transactions grew by 75%, and organic conversion rate increased by 86%. Continuous practice of these strategies and tactics continued to yield more sales from similar levels of search traffic to the Shorefield website. If you’re a frequent traveler like me, you have most likely used TripAdvisor to plan your travel. You can get user reviews for tourist attractions, hotels, and advice for just about anywhere you intend to travel to. TripAdvisor has used social media and SEO to position itself as the best travel website and the best valuable resource for travelers. But before they became popular, they did a lot of legwork every business should emulate. First, TripAdvisor strived to map their audience persona—in order to determine the type of users they expect to see as registered members and customers. This made it easier for TripAdvisor to determine what the user will likely be searching for as creating a great persona entails extensive research. And considering that they wanted to serve a global audience, TripAdvisor leveraged international SEO to attract travellers from all over the world. And of course, most often TripAdvisor went through a technical SEO audit for the website to discover what is working and what’s not working and then try to fix them. But the exceptional thing about TripAdvisor is their user generated content (UGC) for reviews. Aside from the SEO signal it creates, it also creates more engagements and makes a lot of sense having people with a first-hand travel experience share their reviews. That helps a lot in decision making for users – and provides TripAdvisor with a huge amount of data for what their users are looking for, which is automatically implemented by those users. It’s a self-generating SEO system with no upper limit to the potential advantages. And the result is obvious. They are one the best travel websites out there with the largest travel community. While creating high-quality content is great, if your business must succeed online you must develop an easy-to-implement content plan, coupled with social media marketing for some powerful signals that Google can’t resist. And if you use these techniques and put in some work, you’ll see the same results as these travel companies. Pete Campbell is the Managing Director of the award-winning Kaizen. He works with global brands on SEO & Content Marketing campaigns to increase their online visibility. 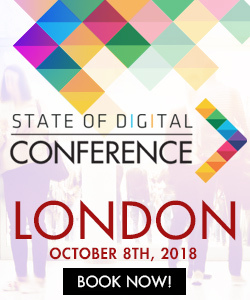 He is also a regular speaker at digital marketing conferences including SMX, BrightonSEO & SEMDays. Voice search and snippets and rankings, oh my!